KDI/Triangle YF-51 4 Way Divider. 50 Ohm .5-2 GHz SMA - New! OR YOU USE TWO SBC ON ONE BACK-PLANE. THIS P4 Y SPLITTER CAN HELP YOU. 2 x ATX P4 4 PIN FEMALE CONNECTOR---CONNECT TO MOTHERBOARD OR SINGLE BOARD COMPUTER (SBC). 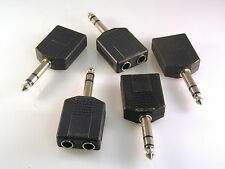 6.35mm Plug to 2 x Socket STEREO Jack Plug Cable Splitter Adapter. This 6.35mm stereo jack plug splitter / Y adapter allows you to connect 2 audio cables to one Socket. The adapter is bi-direction so sockets can be used as input or output. A pair of stereo 3.5mm plug to 2 phono (RCA) socket splitters. 2 pieces per lot! 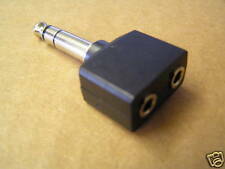 Stereo Splitter 6.35mm plug ( this is the old 1/4" jack plug size ), to 2 x 3.5mm sockets. 150 watts per channel. 0.3dB insertion loss per pair. 2 required. Item Length: 3.75 in. Item Width: 2.14 in. Item Height: 1.14 in. Microlab Model Dx-69FN series of Wilkinson style Power Dividers has been designed for low power applications where output isolation is preferable over lowest possible loss. The wide frequency range of this design allows use with multiband antennas and leaky cable systems. Stereo 3.5mm plug to 2 x 3.5mm socket, splitter. This cable mates seamlessly with all PowerWerx, West Mountain Radio, MFJ, and other power distribution devices that use 15/30/45 Amp Anderson PowerPole connectors. Anderson Powerpole Splitter. 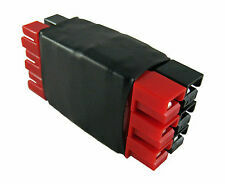 (1) 6-Way Powerpole Splitter. 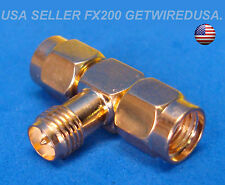 New in ORIGINAL BOX- Data Sheet included-type N connectors 3 way splitter, 200 watts, 800 Mhz to 2.2 Ghz. 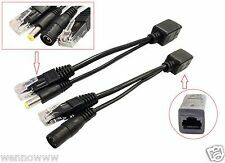 1 to 2 Way 2.1mm Splitter Cable DC Connector CCTV C3703. RF/Microwave Device Type 90 DEGREE HYBRID COUPLER. Characteristic Impedance 50 ohm. NEW & ORIGINAL 1 Piece. Input Power-Max (CW) 36.99 dBm. 1 to 4 Way 2.1mm Splitter Cable DC Connector CCTV C3704. KDI/Triangle YF-51 4 Way Divider. 50 Ohm. 5-2 GHz SMA - New! Product Series FDH 3000 | Mini FDH 3000. FDH 3000 Plug-and-Play Splitter Module, dual 1x16, SC/APC. Application For use in FDH 3000 cabinets. Product Type Splitter module. Distribution Type 1 x 16 splitter. 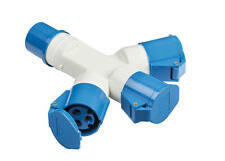 240V 16A 3 Way Splitter 2Pin E. Conforms to IEC-6309. IP44 Rated. 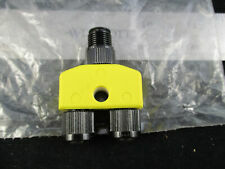 Mini-Circuits ZAPD-4 Splitter/Combiner 2-4.2 GHz SMA Conn. NEW! FACTORY WRAPPED! 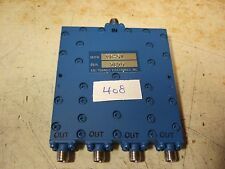 KATHREIN Dual-Band Combiner - p/n 78210620 - 1710 – 1880 - 1920 – 2170 MHz - GSM 1800 - UMTS . Up for sale, KATHREIN Dual-Band Combiner - 1710 – 1880 - 1920 – 2170 MHz - GSM 1800 - UMTS MHz. Power Divider (Splitter), 8-Way, Wilkinson, 2-8GHz, 30W, SMA Condition is New. This cable mates seamlessly with all PowerWerx, West Mountain Radio, MFJ, and other power distribution devices that use 15/30/45 Amp Anderson PowerPole connectors. Anderson Powerpole Splitter. (1) 4-Way Powerpole Splitter. Manufacturer: Kaigon. Part Number: DS2G. 2 Way Digital Coaxial Splitter. All photography is for illustrative purposes only and all persons depicted are models. PART NUMBER:PWRSP1. Wide Band Resistive Type Power Splitter, DC-6 GHz. Error: /- 1.5dB max. (4 GHz to 6 GHz). Error: /- 1.0dB max. (DC to 4 GHz). 2 Way, 50 Ohm, N(m) N(f) N(f). Nominal port to port loss: 6 dB. 400 watts per input. 0.3dB insertion loss per pair. No tuning required. Computer mother board power splitter. 4 way plug to 2 sockets, enables the splitting of power from one of the mother board outlets, ie for powering the dvd, hard drive, fans etc. RF MORECOM, RMC846.5_869_891.5T4M01, CAVITY TRIPLEXER (184717). ANAREN 4J0267 RF POWER DIVIDER 4GHZ-8GHZ MODULE. Anaren Model 4J0267 is a 2-way power divider designed to operate over the frequency range 4 to 8GHz with a power handling capability of 10Watts. MICROLAB / VERIZON. 698-2700 MHz 2 WAY POWER SPLITTER. This series of 2, 3 and 4 way Power Splitters has been designed to evenly split high power cellular signals with minimal reflections and loss. The rugged, lightweight design can be easily attached to a wall with the supplied bracket and clip. PIM < -155dBc. Average Power 300W. RF Connectors Power Splitter N Female 2 Way. Microlab DN-x4FE series of Tappers unevenly split high power cellular signals in fixed ratios from 1000:1 to 2:1 with minimal reflections or loss over the key wireless bands in the range 350 - 5,930 MHz, (there is no coupling 1550 to 1650 MHz). Microlab Model Dx-85FE series of 2, 3, 4 and 6 way Power Splitters have been designed to evenly split high power cellular signals with minimal reflections or loss. Frequency: 698 - 2700 MHz. RoHS compliant. 1 to 8 Way 2.1mm Splitter Cable DC Connector CCTV C3705. A splitter allowing the connection of two outputs to one input. For example, this splitter would be used to share a single TV aerial with more than one TV. This does not affect overseas orders. Great range of products. Power Divider SMA 2-Way - DRF System 800MHz. Condition is New. This is a steal. The splitter enables a single output to be split allowing two units to be powered from a single source. The cable is manufactured using 20AWG cable. Allows you to connect 1 or more units to one power source. 6.2dB system loss through the splitter. Not designed for transmitter power levels. Type N female connector. Part number 993054. IP44 rated. Blue240v 16A SPLITTER. 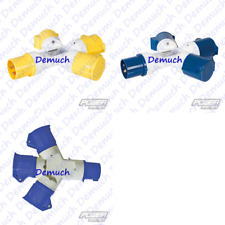 Heavy duty splashproof 16A sockets. 3 way industrial splitter. (3 SOCKETS 1 PLUG). 240V 3-pin sockets. Manufactured from heavy duty durable plastic for site and industrial use. HOLLAND ELECTRONICS DCG2-12SB 2 PORT DIRECTIONAL COUPLER - 12DB. Power Divider. What is Shown in the Pictures is What You Will Receive. 20ea. MCL 90 deg Power Split/Combiner Image Reject 432Mz with pin-out @ schemat. This is for a lot of 20 new Mini-Circuits JSPQ-406-1 two way 90 degree power splitter combiners for use between 125 and 450MHz. All odd numbers are on one long side and all even number on the other.